Hey, I’m thrilled you’ve stopped by today! So… I have a question for you… Do you have a sweet tooth? Did you say yes? If so, you’ve come to the right place. Especially if you have a thing for chocolate and caramel. Or sweet and salty. This will tickle your taste buds into ecstasy. … Until this barely-stir recipe entered my life. It’s absolutely amazing and super simple. It takes a little bit of time, but you can totally just set it and check on it every so often. There’s no heavy arm work! If you’re in a rush and don’t have time for homemade from scratch, that’s ok! I’ve got a quick and easy version for you too. Check that recipe out down below. A not-too-sweet chocolate cake that is moist, light and fluffy and perfect for poke cakes. Preheat oven to 350°F. Lightly grease a 9x13" glass pan. 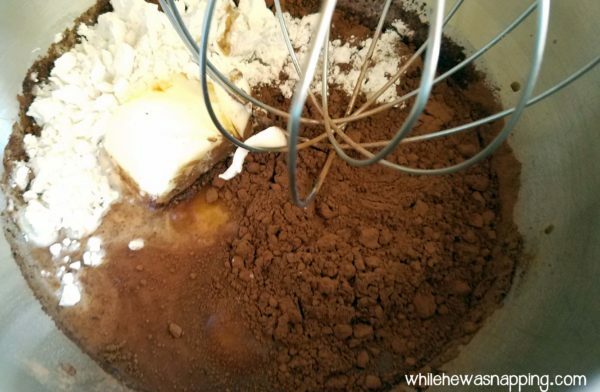 In a large mixing bowl cream together sugar and butter. Combine flour and baking powder. Mix well. Stir in milk until batter is smooth. Pour into pan. Lower oven temperature to 325°F and bake for 28-32 mins. Remove from oven and allow to cool for about 5 mins. Use a butter knife to poke holes in the cake. 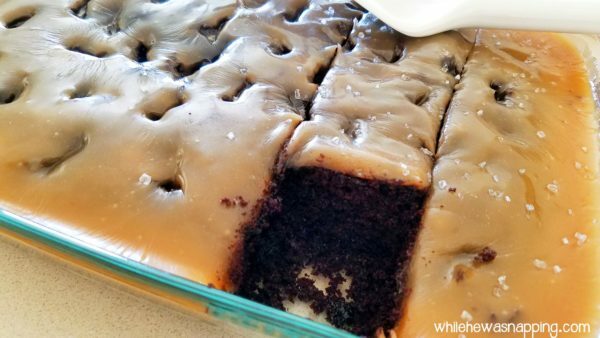 The more holes you make, the more caramel will soak down inside. 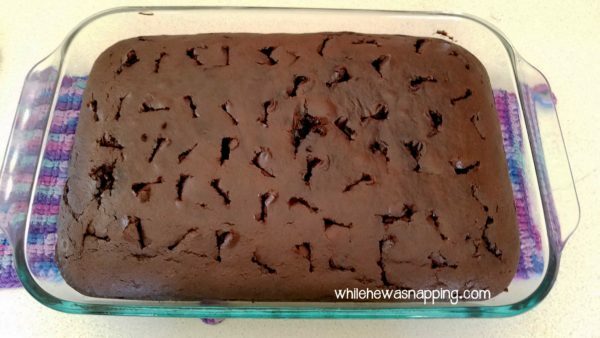 Poke your knife into the cake and give it a little twist to make the holes bigger. The caramel will soak in better. The perfect sweet and salty dessert that will leave your taste buds wanting more! 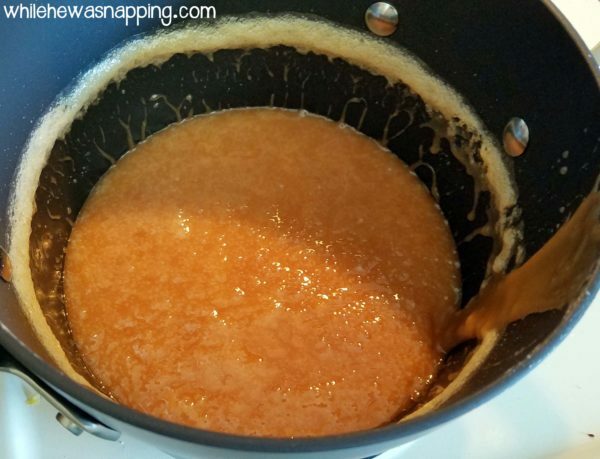 ** If you're in a hurry or don't want to mess with making your own caramel sauce, just use a jar of your favorite caramel sauce from the store and skip to step 11. In a large pot, melt the butter over medium heat on the stove. Increase heat to medium-high. Add sugar and corn syrup and mix until well blended. Add the salt and combine with a spatula. Slowly stir the mixture until it comes to a boil. 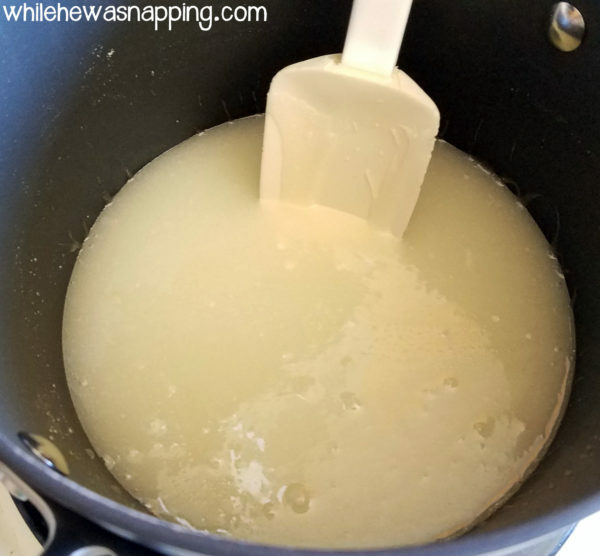 Reduce heat to medium low and let boil 4 minutes without stirring. Remove from heat and slowly stir in the whipping cream. Be careful and don't pour too much in too quickly. It might spatter and could burn. Stirring nice and slow will help get the cream mixed in smoothly as well. 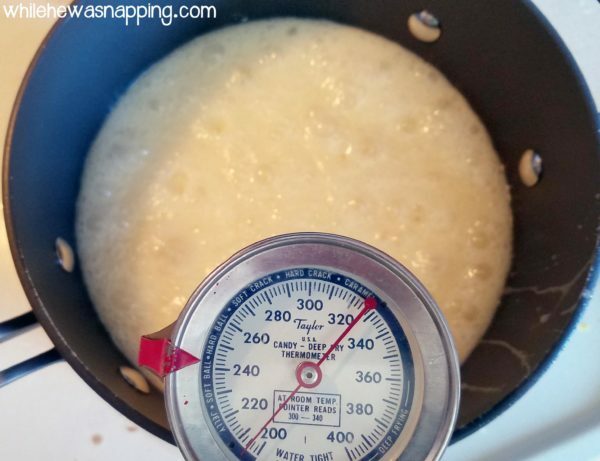 Return to medium low heat and continue cooking without stirring until mixture is 245°F on a candy thermometer. *Note: This makes the caramel a firm chewy candy. You'll probably have to cut the caramel on the cake with kitchen shears, but I love the chewy texture. For most people, a caramel sauce will be more to your liking. There's lots of recipes, but I've never tried any and don't have a favorite to point you to. You can even add sea salt to the sauce and make it salted caramel sauce if you'd like. Pour caramel over the cake (recipe above). If your cake is domed after you bake it, you can use a spatula to pull the caramel back to the middle as it soaks in and cools down. If desired, sprinkle caramel with sea salt before it cools too much. If the top has already started to firm up, you can gently press the salt into the caramel with the palm of your hand. Be careful, the caramel will still be hot! Allow to cool completely (2-3 hours). 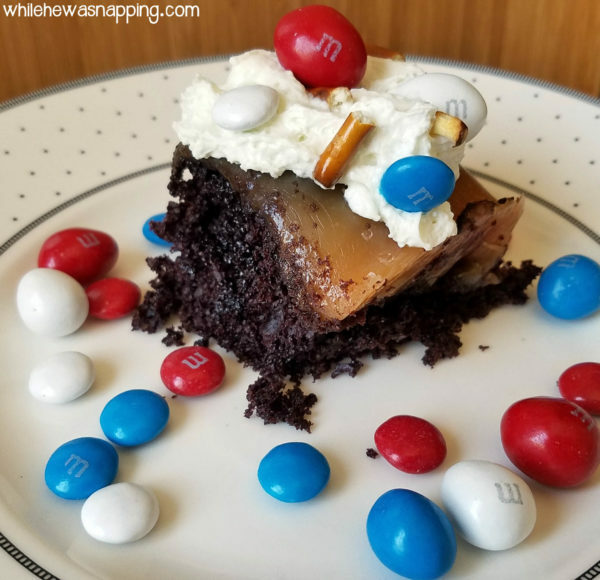 Slice and serve topped with whipped cream, pretzel sticks and M&M's® Red, White & Blue Milk Chocolate for the perfect sweet and salty ode to America. This cake is super moist, not too sweet and the perfect blend of sweet and salty. I wanted to add some patriotic love to this cake and the M&M’s® Red, White, & Blue Milk Chocolate were perfect. 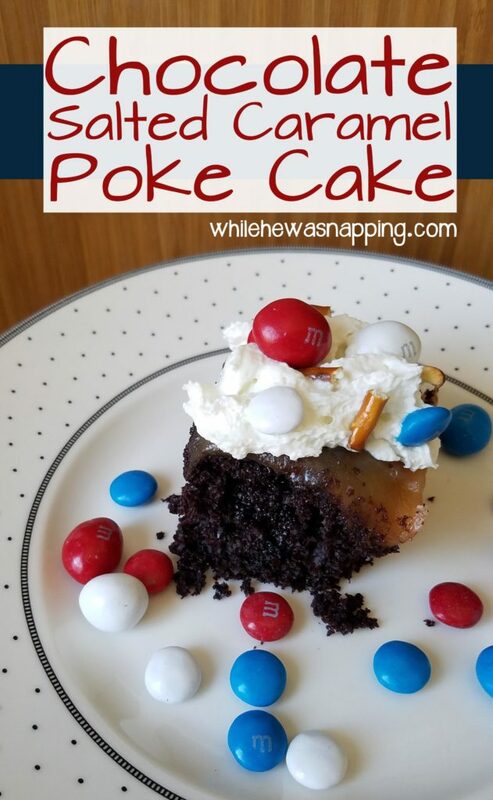 They also have M&M’s® Red, White, & Blue Peanut that compliment the sweet and salty of the cake just right. Maybe you’re more a Skittles® fan? Well, there’s Skittles® Red, White, & Blue too! I’m not sure I’d eat them with the chocolate caramel cake, but they are pretty tasty little treats. Right now MARS/Wrigley is showing appreciation of our troops by donating M&M’s® to the troops for every bag purchased at Walmart. Select stores will have representatives sharing more information about the “1 For You, 1 For the Troops” campaign exclusively at Walmart. Did you know that M&M’s® were originally created for the troops? 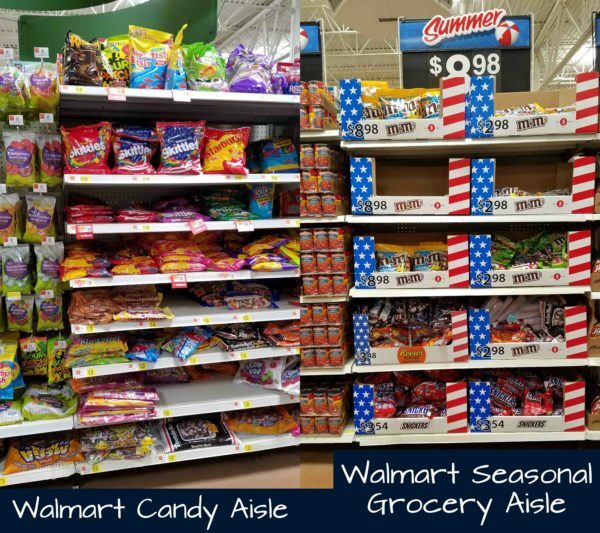 Keep the tradition going and buy M&M’s® at Walmart or Walmart.com. Supporting the troops is definitely something I can get behind. America has always held a special place in my heart. I truly love this country, despite any flaws she may have. When I met my husband, he was a soldier. 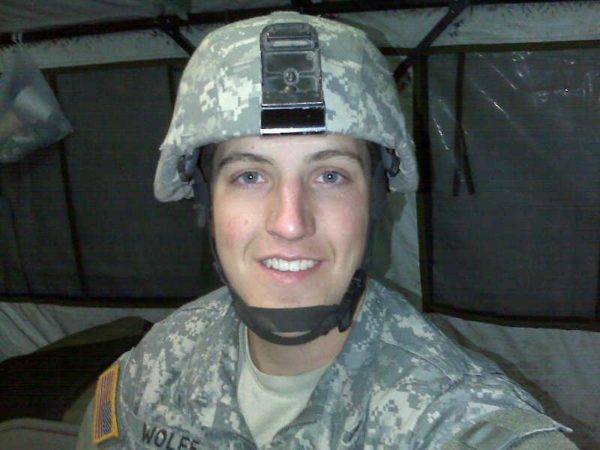 We have lived the life of a military family and I had a love-hate relationship with the military, for many reasons. But, I will be forever grateful for and to the courageous and selfless men and women who defend our freedom. The brave people who leave their families to stand against and protect our rights and privileges. I admire and respect the families that are left behind, the single parents who hold their homes and families together while the one they love most is thousands of miles away, often in mortal danger. The men, women and families who make up our armed forces are some of the strongest, bravest, courageous and selfless people I have ever had the privilege to know. I am so grateful for the time we had among those heroes. I will always respect, admire, and love those who have, who do and those who willingly sacrifice holidays, birthdays, anniversaries, time with their families, their health and even their lives to protect this country and all those within her borders. If purchasing a bag of M&M’s® or Skittles® can help lift a service member’s day with a small treat, it’s the least I can do. Help support our troops and grab a bag (or two!) at Walmart today. And check out more fun patriotic recipes for your celebrations this summer! I hinted at the quick and easy version earlier; but, as promised, here’s the recipe. This is a little different consistency and flavor, but still really yummy. 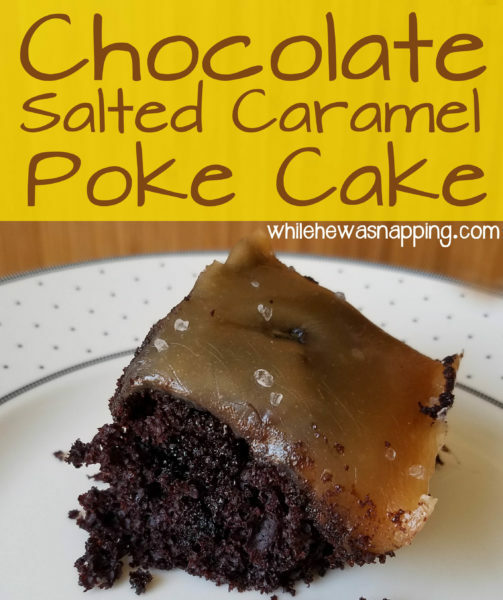 Quick & easy chocolate caramel poke cake ready to serve in 45 minutes! Mix and bake the cake according to the directions on the back of the box. Remove the cake from the oven and allow to cool for 5-10 mins. 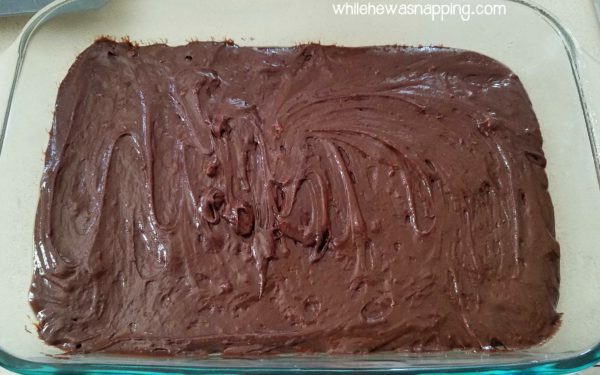 Use a butter knife to poke holes in the cake. 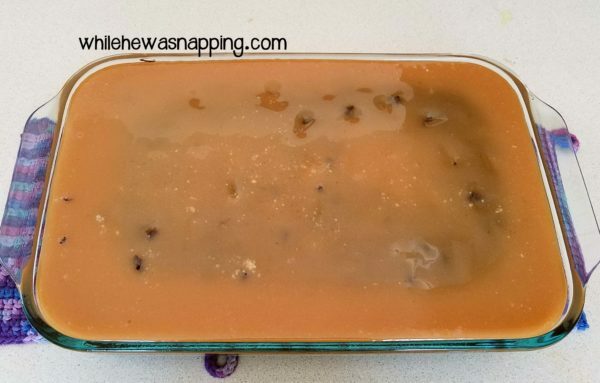 The more holes there are, the more caramel will soak in. You can give the knife a twist after you poke it in the cake to make the holes a bit bigger. 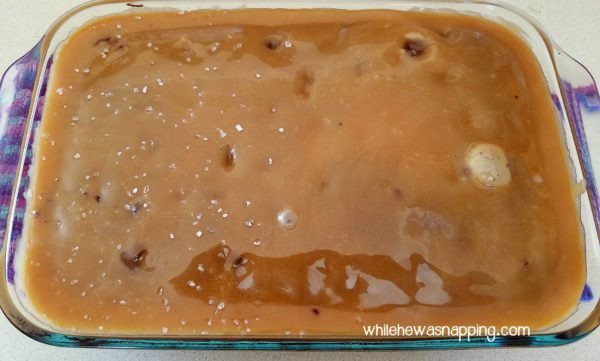 Pour half the caramel over the cake and let it sit and soak in for 10 minutes. Pour the other half of the caramel on top and let it soak in. Slice and served topped with whipped cream, pretzel pieces and M&M's® candies. What a great recipe…caramel..oh yes! 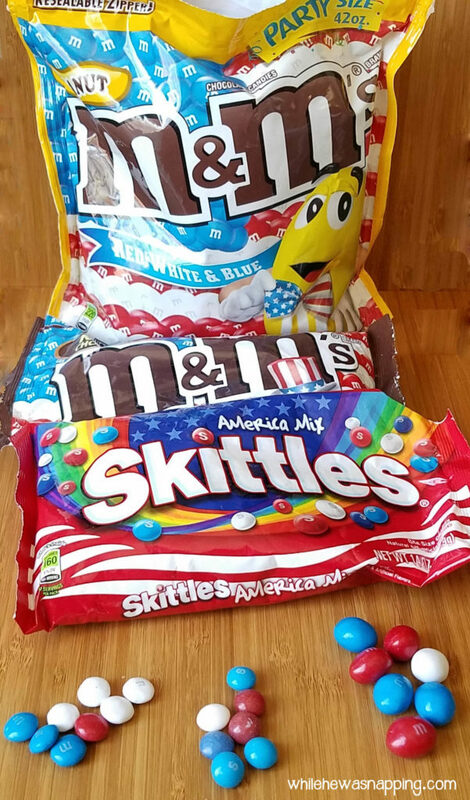 I will have to check out the re white& blue M & M’. I hanthm. What a fun idea. Suppose to say I haven’t seen them! darn computer!